Inverness Foodstuff have been shortlisted in the Celebrating Communities award category at the Scottish Charity Awards 2018. Inverness Foodstuff was established in June 2014 by a group of people from local churches and the community in an attempt to address the problems of homelessness, food poverty, social isolation and food waste. 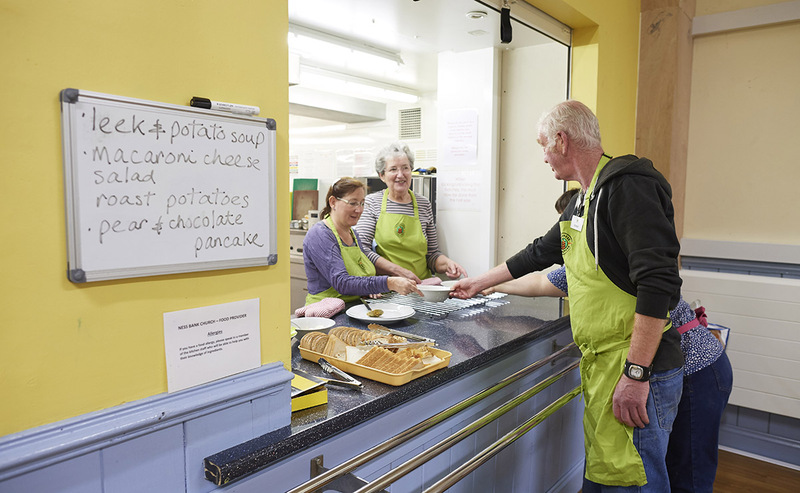 As the only service of its kind in the city, the team aim to provide a safe, welcoming place for people who are homeless and/or vulnerable, to enjoy a much-needed nutritious meal, company and access to further services and support. “We are a small charity that is having a huge impact for good with the homeless and vulnerable in our city. Inverness Foodstuff becoming a finalist at this year’s Scottish Charity Awards is a fantastic encouragement and morale boost for our 84 volunteers. Without them, the wonderful community that is Inverness Foodstuff would not exist. “Although it was three years ago that Inverness Foodstuff started to serve food, the story actually began eight years ago when Ness Bank Church had the vision to be a church that reached out to those most in need in our city and then had the courage to step out in faith and work to raise the £130 000 that was needed to build a large commercial kitchen, new toilets, storage facilities and a church office. The 84 volunteers and one Volunteer Manager who make up Inverness Foodstuff’s team use surplus food from local shops to help those in need, whilst also tackling food waste at the same time. In their application, Bob Glover, Treasurer and Elder at Ness Bank Church, said: “We were aware that many of the large supermarkets were wasting a huge amount of food and this was difficult for us to accept when so many people were hungry. Since the first dinner session in February 2015, the centre has dished up more than 6,756 meals to its participants. In February 2015, Inverness Foodstuff were able to start providing a three course meal every Tuesday and Thursday for participants, with around 30 people attending each session. The centre is also open on a Saturday afternoon, when soup and sandwiches are provided free of charge. 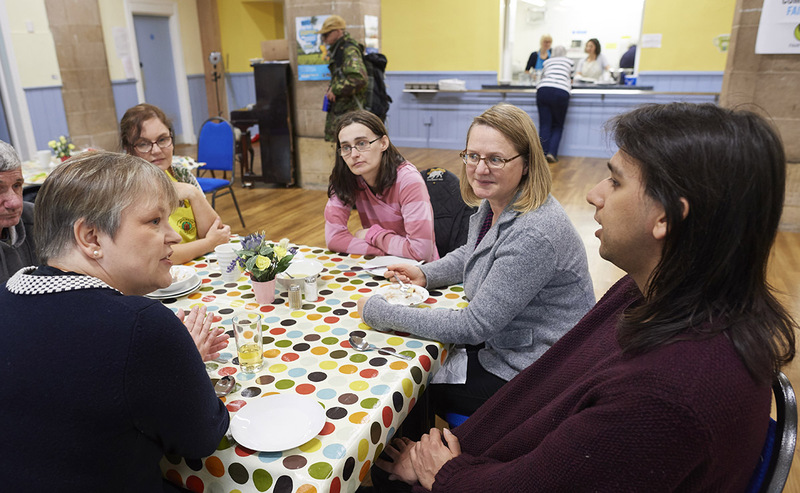 Rev Fiona Smith attends a three course meal with participants, held every Tuesday and Thursday at the centre. Alongside providing nourishing meals to visitors, Inverness Foodstuff also provide access to the Internet, clothing, hairdressing services, and contact with welfare and support services through partnerships with local authority and NHS services. On a monthly basis, representatives from the Highland Council Benefits Team, the NHS Dental Team, the NHS Harm Reduction Team come along to the centre, as well as a Nurse Practitioner for the Homeless and a member of the Community Nursing Staff who visit each week. Access to these resources is designed to enable participants to equip themselves with coping skills to manage life’s challenges. Alongside meals, Inverness Foodstuff offers access to the Internet, clothing, hairdressing, and health and wellbeing services. The service has been shortlisted in the category of ‘Celebrating Communities’, which looks to recognise outstanding grassroots or community initiatives. Judges will choose the winners of each individual category, however the People’s Choice Award is open to everyone to vote for one of the 40 finalists. To vote for Inverness Foodstuff to win, you can fill in the voting form. The awards ceremony will be held at the Edinburgh International Conference Centre (EICC) on Thursday 14 June. 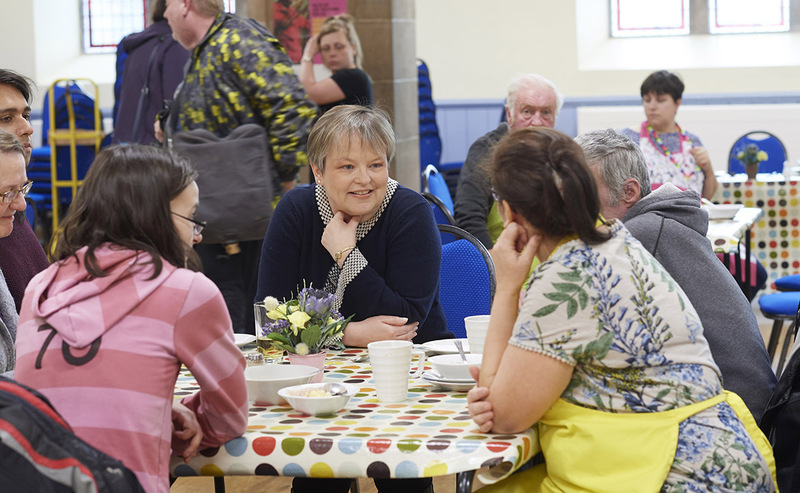 Find out more about the Church of Scotland’s work on ‘Health and wellbeing’.